This wiki cheese category page contains detailed information and photographs of cheeses produced in the English counties of Cumberland and Westmorland. 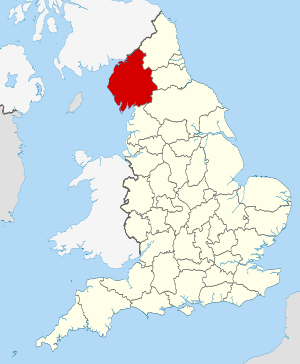 Cumberland and Westmorland, together with the Furness area of Lancashire, now form the county of Cumbria in the extreme north-east of England. A predominantly rural county, Cumbria is home to the Lake District National Park, considered one of the most beautiful areas of the United Kingdom. The area has provided inspiration for generations of British and foreign artists, writers and musicians. Much of the county is mountainous, with the highest point of the county (and of England) being Scafell Pike at 978 m (3210 ft). All the mountains in England that are over 900 metres (3,000 ft) above sea level are in Cumbria. Parts of Hadrian's Wall can be found in the northernmost reaches of the county, in and around Carlisle. Pages in category "Cumberland and Westmorland cheeses"
Page modified 16:51, 17 November 2015.